PHOTO COURTESY BURKETT FAMILY Belinda Burkett, a Fostoria City Schools eighth-grader, won a clock trophy — the top prize for a 4-H project — for her Investigating Electricity 4-H project this year. A Fostoria girl has found success in electricity. Belinda Burkett, a Fostoria City Schools eighth-grader, has been in 4-H for four years and is a member of the Seneca Pens and Friends 4-H club. She has taken electricity projects every year: Investigating Electricity twice, Magic with Electricity and Science Fun with Electricity. 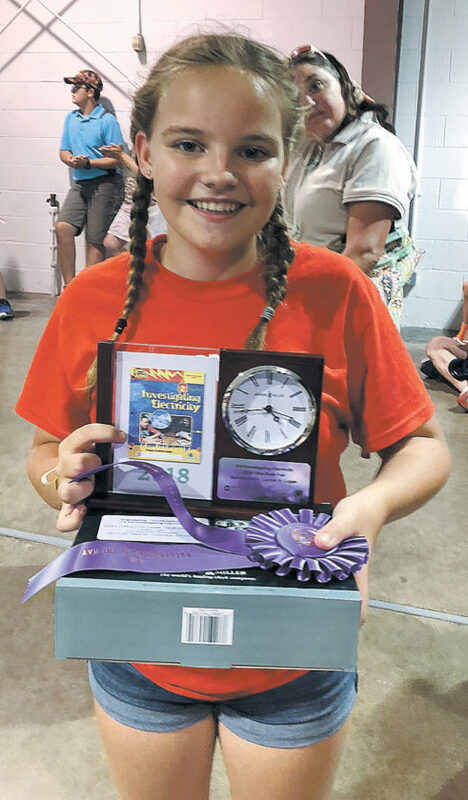 Burkett won a clock trophy — the top prize for a 4-H project — at the Ohio State Fair for her Investigating Electricity project this year and her Science Fun with Electricity project last year. Also, Burkett won the Julie Miller Memorial Award for the top female in electricity this year. Burkett said she enjoys working with electricity and would like any job in the electricity field. “I want to become (an) engineer,” she said. Burkett said her father does a lot of the wiring with receptacles at the family’s house. She tried it and said she thought it was interesting. “You have to line up certain wires together,” she said. Burkett said she enjoyed learning about electricity. She said she finds going through some of the issues, such as friction or resistance, and coming up with ways to overcome them interesting. This year, she exhibited a radio-controlled carousel. She used a receiver from a Lego set she disassembled and had to solder it to a motor. “I had to check the polarity,” she said. The display used two 1.5-volt batteries. “I had to make my carousel, which took a long time. … It did work,” she said. The display also featured tubing through which water would flow, which was a representation of what resistance looks like in wire. It showed how ohms or resistance work, Burkett said. “It was a waterpark attraction,” she said. Burkett said she probably is going to take an electricity project again next year and thinks she is going to move into a category that’s a step up from what she has been doing. She said she is going to start thinking about what her project is going to be, and she thinks she is going to do another carnival theme. “I have to think of what exactly,” she said.